My Arctic artist residency commenced properly on Monday the 3 October 2016. Prior to this we had spent the weekend in Longyearbyen getting ourselves orientated in the North and getting to know one another before setting sail on the Arctic seas. 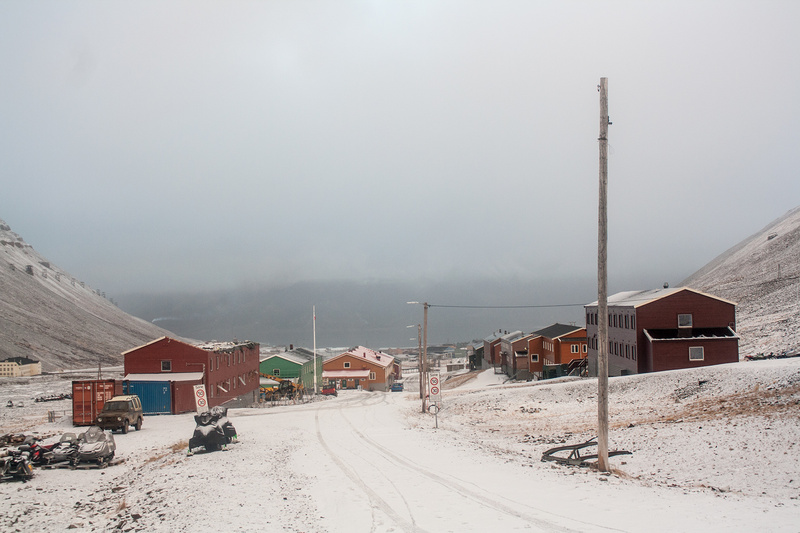 The first snow of the winter had fallen in Longyearbyen over the weekend and it was continuing to snow as we boarded the tall ship that was to be our home for the next couple of weeks. 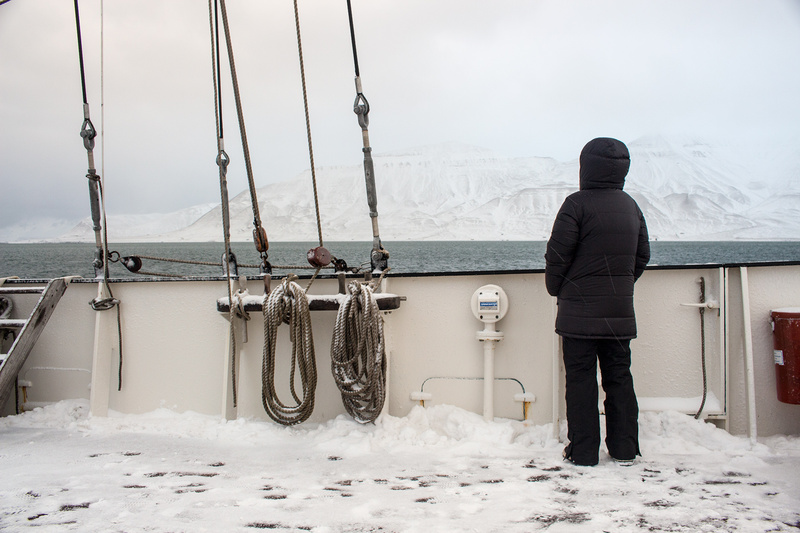 Setting sail in the snow made for a magical start to our arctic adventure. However, that magic was soon curtailed as we encountered the swell of the sea whilst sailing out of Isfjorden. Having only been at sea for a matter of hours none of us had yet gained our sea legs and so the vast majority of us started to feel seasick as we sailed headlong into the swell. In fact sailing in the swell became so bad that we changed course fairly quickly and instead of taking the route north that had been planned we headed into calmer waters in Tempelfjorden and made towards Bjonahamna. Once we were into calmer waters we were able to set some of the ship’s sails which helped to stabilise the ship. Now that things had calmed down the seasickness started to subside and we were able to enjoy the experience much more. Darkness had set in and a few of us were standing out on deck wondering at the starry arctic skies. It wasn’t long before the aurora started to light up the skies. Waves of green light flickered across the starry skies. They were particularly intense and right above us as we sailed. We had been at sea for less than 12 hours and here we were sailing beneath the Northern Lights! I didn’t manage to capture any photos whilst we were sailing beneath the aurora but my ship mate, and photographer, Tama Baldwin managed to shoot a couple of images like that posted above. After the Norther Lights had come and gone we continued to sail until around 23:00hrs at which point we dropped anchor at Bjonahamna. We awoke to find ourselves in a glorious snow covered bay with mountains rising up from the water around us. As with every landing that followed we were limited with regards to the area that we could explore due to the risk of an encounter with a polar bear. We had four armed guides with us who would make land ahead of us to mark out, and stand guard over an area for us to explore and work within. We were truly out in the wilderness. There was something indescribably alien about the landscape. 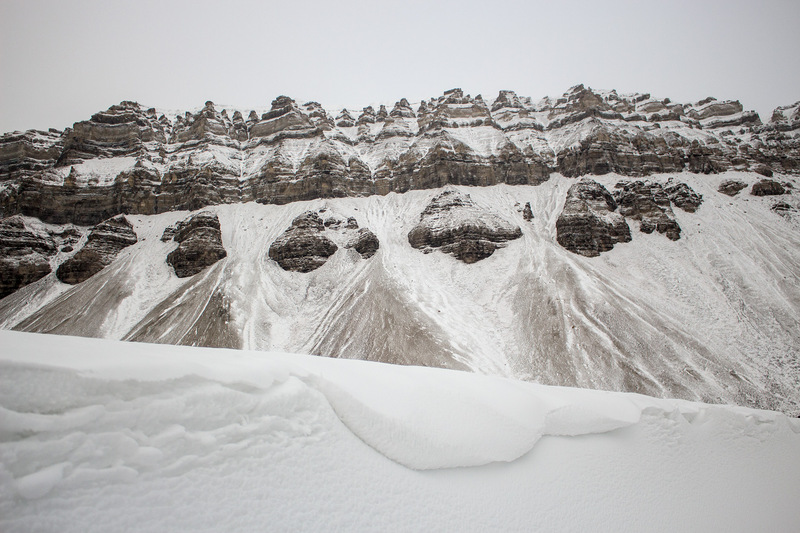 We landed on a snow covered beach leading up to a lo plateau in front of us. There were towering mountains either side of us and mirage-like mountains disappearing in and out the mist in the distance across the plateau. It was fascinating to watch everyone set about recording the landscape, and/or their experience of if it, in different ways. Photographers set up their tripods beneath the towering mountains, some of them hiding beneath the cloths of their analogue large format cameras, whilst some, myself included, found ourselves a spot from which to draw from the landscape. This would become something of routine for the next couple of weeks as we explore the coastline of Svalbard.